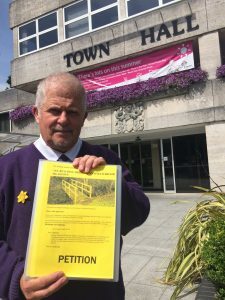 A 100-signature Petition – “Re-Building Bridges” – was delivered to the Crawley Town Hall at 2pm last Monday. The Petition calls for the re-building of two wooden bridges in Ifield Brook Meadows – Crawley’s newly-designated ‘Local Green Space’ – for its 70th Anniversary. The original bridges were dismantled by the Homes and Communities Agency 8 years ago (2009), thus preventing access to the most beautiful part of the Meadows – The Riverbank Walk. The Ifield Society has been organising local community ‘Summer Ramblettes’ – short walks – every Saturday to this ‘hidden gem’ – the last Ramblette being this Saturday from the Plough in Ifield Village at 12 Noon [to 1pm]. This Petition has also been organised so the two bridges can be re-built before the end of this year – the town’s 70th. It is then hoped more people in the local community can fully enjoy the newly-protected ‘Local Green Space’ of Ifield Brook Meadows – with its beautiful Riverbank Walk.